It’s undeniable: many people find Tarkovsky’s films uniquely boring. They also find them precious, pretentious, unendurably slow and finally mystifying – or just mystificatory. Here’s one reviewer: ‘Um, if you were driven to distraction by the slow pace of 2001: A Space Odyssey, then you’ll be well advised to stay clear of this film. Solaris may not have an opening shot that is nearly ten minutes long (like The Sacrifice) but it comes pretty close to it. So if your taste in movies tends towards the let’s blow everything up to the accompaniment of a loud soundtrack like in Independence Day, then don’t even bother with Solaris.’ That’s from scifimoviepage.com. I would like to address this directly – Tarkovsky’s boredom; the boredom that some people find uniquely in Tarkovsky’s films. Not that I think I am addressing these people. Because you are at this conference, you are unlikely to find Tarkovsky objectionable in any major way. (This piece was first written for The Art of Andrei Tarkovsky symposium at Tate Modern, 9th May 2008.) You might say that you never find Tarkovsky’s films boring – and, ultimately, I would say this, too. There is a way that, for me, they are the most fascinating films ever made; at least, the final films – Nostalgia and The Sacrifice – are. But there is quite a long, slow way to go before I reach this point of total fascination – before the Stalker gets me to the Room. To answer the question that I feel is now hovering in the room. ‘Did you ever personally ever find Tarkovsky’s films boring?’ – [Pause] – ‘Yes, I did.’ – However, it was boredom of a particular sort. When his scenes were long and slow, I was impatient for something to happen. To a greater extent, though, I was impatient with myself for becoming impatient. I got frustrated with how Tarkovsky was trying to do what he was trying to do. But I admired what he was trying to do almost without reservation. I would like to begin by showing you the start of Solaris. It is my only clip. Tarkovsky himself had reservations about Solaris – thought it a failure – and this, I think, is because it didn’t fit with his grandest project. The opening, however, is a demonstration of the way Tarkovsky addresses the screen itself. As you’re watching it, I’d like you to think about what this sequence is doing to you, and what it wants to do to you. Roll film. You should watch from about 3.00 until 4.36. (Unless you just want to watch the whole thing). It’s here on YouTube – I can’t link directly because the content’s blocked. So, what did it do to you? First of all, it slowed you down. There are events on the screen: initially, the reeds beneath the water establish a rhythm but our absorption in this is interrupted by the diagonal entrance and departure of a heroic leaf. I think it’s an elm or a birch leaf. Then there are the camera moves, to which we almost immediately become extremely sensitized. They are, so far, all that we have of a developing story. Secondly, the opening challenges your expectations. (Think of how each of the Star Wars films opens: the stars, a spaceship, a bigger spaceship, lasers.) You go into the cinema expecting – at the very least – to see something significant or amusing happen on the screen. The opening of Solaris functions in opposition to this: it forces you immediately to sit and wait for something to happen. Our expectations are reduced, so that smaller events – the leaf, the slow camera moves, a man scratching his head – are magnified. Lastly, in this reconfiguration of the screen, Tarkovsky changes it from a traditional projection-space into a field-of-possible-action. Yet the screen as field-of-possible-action isn’t something Tarkovsky is able to maintain throughout a film – although, I’d say, he secretly aspires to this. Usually, our eyes are ping-ponged around in traditionally established ways. Whenever a human face is brought into vision, our gaze will flit between eyes and lips, remaining mainly on the eyes. When the rest of a human body is visible, we will explore it, always returning to the face and hands. When a group of people are on screen, we will – most of the time – look at the person speaking or the person whose reaction to the speech is most emotionally charged or, more simply, the one we fancy the most. Our glance here can also be controlled by the eye-movements of the people on screen. When a noise or voice comes from off-screen, we will attempt to look towards it. And then of course there is the enforced attention-switcher of the close-up. But when relative emptiness and stillness fill the screen, or there is huge but undifferentiated complexity, or a face is held in view until we cease to perceive it as just a face, our eyes will first search for an obvious focus and then, if they do not find one, they will wander in expectation that a focus will soon appear. The promise of cinema remains: This is a screen, keep watching it, significant and amusing things will happen here. These moments or minutes of eye-wandering are created more easily when the screen is empty of actors. But, I think, Tarkovsky very frequently wishes people in his audience to be offered the choice to look at different things within the visual field. In The Sacrifice he frequently has six or seven actors in view at once – avoiding close-ups almost completely. Even though one or other of them is usually speaking, they do so slowly, with pauses in-between, and we are at liberty to concentrate on whomever we find most fascinating. (Screwball comedy, it ain’t.) In this, Tarkovsky is more like a theatre director, for whom close-ups are unavailable. When our gaze isn’t controlled, is allowed to wander, a different kind of tension is established – and it is one that many viewers find unbearable. And which, as a result, they would call boring. They would prefer to leave the cinema than to have to sit through a sequence such as the candle-carrying sequence in Nostalgia. And even those who know and love Tarkovsky’s work and methods will find themselves, from time to time, having to overcome anxiety, irritation, distraction and boredom. I’d like to return, just for a while, to the idea of fields – agricultural fields and liberated visual fields. Both are a constant in Tarkovsky’s work. Remember the final shot of Mirror (from 1:40:14) – the camera retreating into the forest, away from the familiar field. There is a remarkable sequence in the documentary Tempo di Viaggio, Time of a Journey. Tarkovsky has been asked what he’ll do when he returns to Russia. There is a second characteristic of Tarkovsky’s eye-freedom here: the deliberate uncertainty – ‘It is difficult to tell whether it is fog or flowers’, mirror or direct view, shadow or shape, water or glass. This is Tarkovsky’s visual signature – or one of them. But I would like to remain with the fields. In the documentary Directed by Andrei Tarkovsky, also based around the making of Nostalgia, Tarkovsky says, ‘I have a contemplative relationship with reality.’ This, I’d say, is the kind of relationship he tries to encourage his viewers to have with his own images. One thing about them is that they are often fields we are allowed to explore in our own way; a second thing, equally significant, is that we are allowed to explore them in our own time. This is a crucial point. Tarkovsky’s films are slow because he very often leaves things on the screen long enough for us not just to see them but to contemplate them – and not only this, but long enough for us to lapse from contemplating them, realise this, and return to contemplating them for a second, third or a fourth time. Because Tarkovsky’s films are slow, the easiest way to shorthand them is to say that they are meditative. This, obviously, doesn’t go anywhere near far enough. 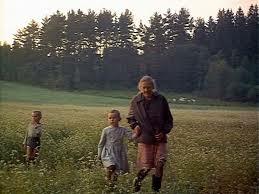 They are themselves Tarkovsky’s own meditations. But, even more so, they offer themselves up as objects of meditation for us. And as with meditation, particularly the Zen Buddhist practise of zazen or ‘just sitting’, the failures of consciousness are just as important as the moments when consciousness is stilled or transcended. 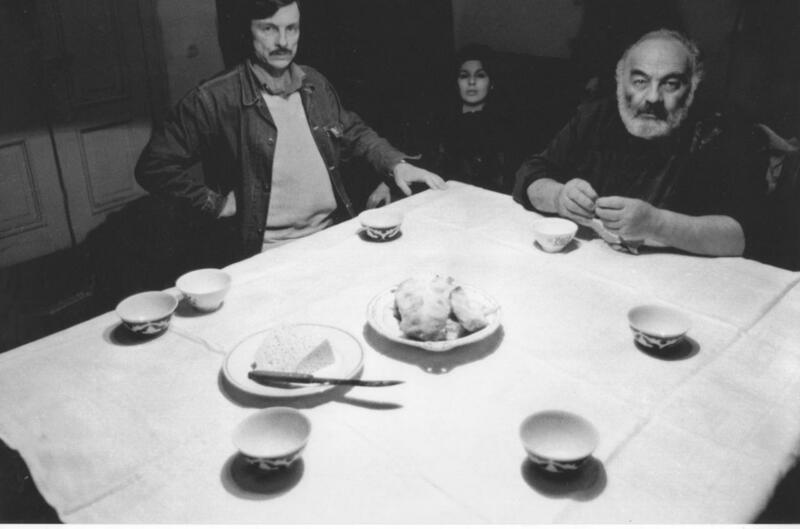 Tarkovsky’s liberated visual fields allow and encourage lapses of attention. A second looking overwhelms the first, and is itself – after a break – usurped by a third. Even as we watch it, we have the time to re-view the film. And at a certain point, we start to look at our own looking. Obviously, the films have narratives which draw us onwards. But we aren’t expected to be constantly entertained. Instead, we return to the film repeatedly, re-committing ourselves to watching it to the end. An aside here about DVDs. Although they allow us to see what Tarkovsky’s films look like, just as MP3s allow us to hear what an album sounds like, they are not Tarkovsky’s films. Tarkovsky’s films only exist as cinematic presentations. More, I’d say, than any other filmmaker, his films require us to be brought together, isolated in a common dark. I hope I have gone some way to explaining how I see Tarkovsky’s boredom as working. I’d now like to finish by giving a short explanation as to why he made his films this way. Now, it’s very easy to dismiss this as typically vague pseudo-profound statement of the sort to which Russians are given. However, I think Tarkovsky meant exactly what he said, and meant it on this level – that every single frame of his films should, in and of itself, help man to improve himself spiritually. Tarkovsky’s films make a virtue – literally – of the very, very long shot. Perhaps the most famous of these comes in Nostalgia. For eight minutes forty-one seconds an ailing man in a heavy overcoat attempts to carry a lit candle from one end of a drained, misty Roman Baths to another. He fails, repeatedly; three times the candle blows out – three times the man has to return to his start-point, relight the candle and set out again in uncertainty. It is Buster Keaton redone as Existentialism. What we have in this scene is clearly and unmistakably a very simple and beautiful but also painful metaphor for all human struggles – especially spiritual ones. In fact, the metaphor is so blatant that, at moments, I am almost embarrassed to watch – even though, and here’s the thing, I know that on the fourth attempt the man will succeed in reaching the far end. Admit it, some of you are relieved I won’t be showing this scene. The people who are patient enough to sit through Tarkovsky’s films are patient people. They are, I’d argue, very likely to be better people than those who walk out or reject this kind of cinema entirely; more considerate, more capable of self-control, less quick to anger, less manipulable by bright lights and loud bangs. What they try to achieve is a similar effect to meditation. Even if this is not true, I think it comes close to what Tarkovsky believed – his grandest project. And by being so utterly out of step with our times, it reveals these times all the more vividly. They are, in their hyperactive way, very boring times indeed. This entry was posted in Bloggings and tagged Andrei Tarkovsky, art, Boredom, Boring, Ethics, Film, Meditation, Tarkovsky, Zen. Bookmark the permalink. « When Is It Impossible To Be Distinctive and/or Original?